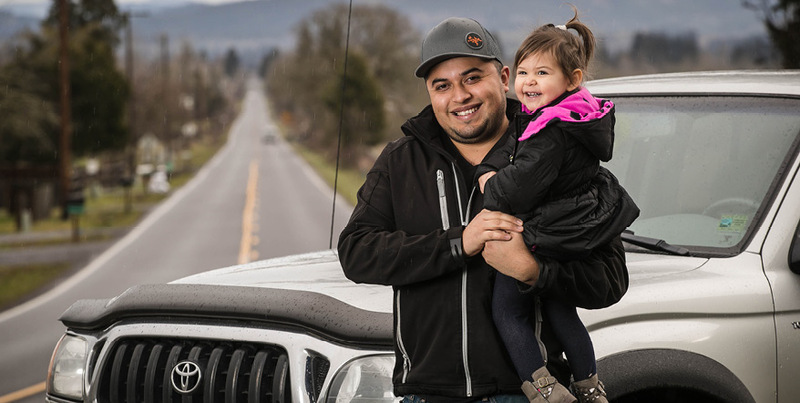 When Juan Jimenez was a toddler, his dad would work for months at a time away from home, eventually finding steady work in Oregon. He fell in love with the region and moved his wife and kids to the Willamette Valley. Juan was just four when he and his siblings arrived in the U.S. Like most kids, he studied hard, made friends, and planned ahead for the future. But unlike a lot of kids, he also became bilingual – a skill that he utilizes on a daily basis. With his bilingual background, involvement in the local Latino community, and his energetic personality, he was hired on at a local dealership right out of high school. A few dealerships later, he got hired at Kendall in the parts department. “My dad has always loved cars,” Juan said thinking back to his childhood. “When I was growing up, he’d take me to the dealership every time he’d buy something new. I think that’s why I wanted to work at a dealership. I do a little bit of everything at Kendall, especially because I can speak Spanish,” Juan commented. Three years ago, Juan met his future wife at work. A short time later they were married and welcomed a baby girl into the world. And while he once spent most of his disposable income fixing up and tricking out cars, his priorities quickly changed after becoming a dad. Today, he’s saving for his daughter’s future and making moves toward his next career. That willingness to try something new is what brought Juan to Northwest Community Credit Union. Today, the Jimenez family uses Northwest Community Credit Union for all of their financial needs, including a Northwest Visa® Rewards® Card. At Northwest Community Credit Union, we know that uncommon is different for everyone. Whether he’s financing a dependable vehicle for his family, using eBanking on his smartphone, planning ahead for a career in law enforcement, or working with members of the Latino community, we’re proud to be part of Juan’s plan and help him reach his ideal financial future.